While similar products contain only Glucosamine, or at most three or four ingredients, there are eleven ingredients in Synflex, all working synergistically to effectively manage osteoarthritis, aid in rehabilitating damaged cartilage, promote healthy joints, and reduce inflammation. I adopted my lab at 6 months old. Shortly after that, he was diagnosed with hip arthritis from a trauma, he had been abused. He has been on Synflex and a daily aspirin for much of his 13 years. Synflex helps to keep him going and has been responsible for us being able to avoid putting him on medications. For us it has worked great and he is a happy dog. This stuff is fantastic! 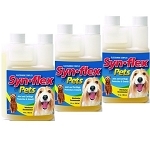 My 11 yr old arthritic dog is walking better and easier and it started within the first week of taking synflex! I highly recommend this product for dogs and now I'm giving it to my 14 year old cat as well. Cheaper than injections, better than pill form glucosamine. Fantastic for arthritis in cats! My elderly cat has arthritis. 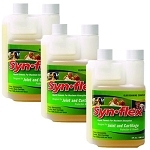 After starting on Synflex, his limping completely disappeared! !